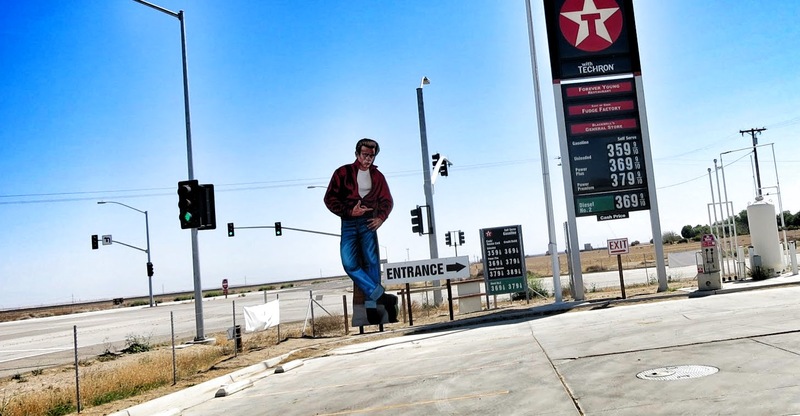 James Dean made his last stop at Blackwell’s Corner, a gas station located on the intersection of Highways 33 and 46, just outside of Lost Hills, CA. After finishing an apple and Coke, he and his racing mechanic Rolf Wütherich, got back into the Porsche 550 Spyder, and sped down Highway 46 (then called 466) towards Paso Robles where he was to meet up with friends, ultimately heading to Salinas for a race. But he never made it Paso Robles. 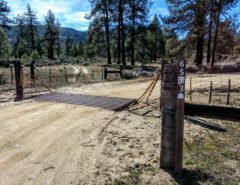 Just 26 miles later, where Highway 46 meets Highway 41, he crashed head on into a Ford Tudor Coupe that had turned left into his path. Dean’s Porsche 550 Spyder had flipped into the air and landed into a gulley. Donald Turnupseed, who was driving the coupe, said he never saw the Porsche coming. The actor was clinging to life when he was put into an ambulance, but was pronounced dead soon after. Blackwell’s Corner was named for George Blackwell, who started a rest stop here in 1921. 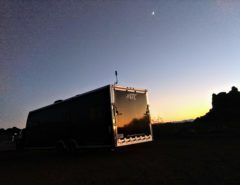 It had quickly become a popular stopping point, providing travelers with fuel and food. Before the Interstate system, Highways 466 and 33 were popular routes for auto enthusiasts and racers because they could avoid the slower route 99 through Bakersfield. 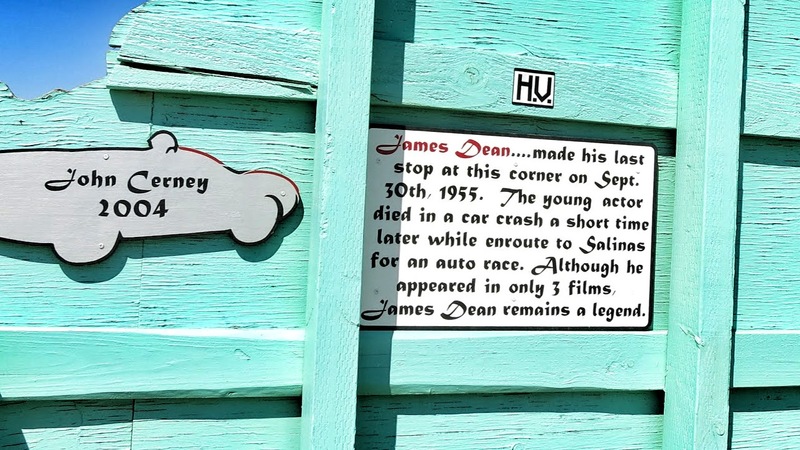 In 1977, a memorial for James Dean was erected about a mile west in the town of Cholame. The decision to not place the memorial at the location of death was because the intersection of Highways 46 and 41 had been realigned since to make the transition safer, putting the actual accident scene well away from the road. On September 30, 2005, the junction at Highways 46 and 41 was dedicated as the “James Dean Memorial Junction” as part of the state’s official commemoration of the 50th anniversary of his death. Hauntingly, during the filming of Giant, James Dean made a public service announcement cautioning people to drive safely. “The life you might save might be mine”, he stated. 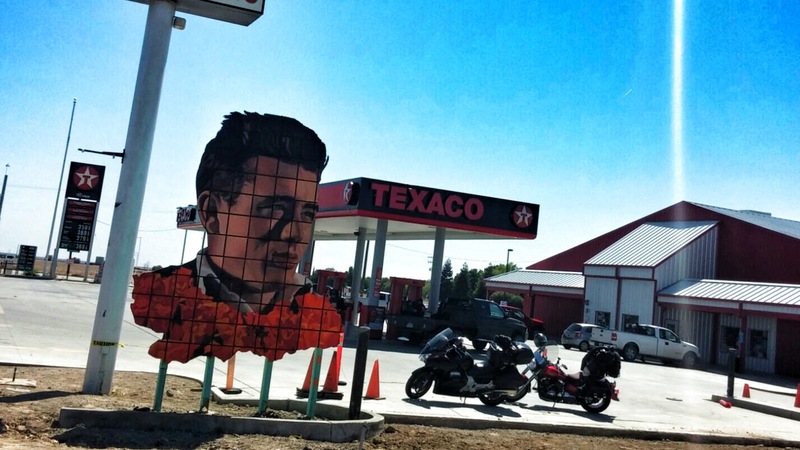 This large bust of James Dean is well visible to travelers along CA-46. Steve Johnson’s comments with regards to the James Dean story….mentioning his stopping at Blackwell’s Corner on 9-30-55 are very factual….especially mentioning the “Racer’s Route” short-cut on Rt. 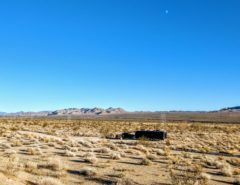 33 around Bakersfield and Rt. 99. Today, Blackwell’s Corner has a nice exhibit paying tribute to James Dean with memorabilia and books. A perfect place to stop on the way to the James Dean Memorial Junction about 30 minutes west on Rt. 46/41… and a bit further up the road to the James Dean Memorial on Rt. 46. This is a fascinating journey for everyone…interested in the American icon, James Dean.